This morning I was at BNI Ashford again and I thought I sit up and take even better notice of all members' weekly presentations (the tips of Kent in the back of my mind) to see who I thought would deliver the best this morning. Low and behold, the chapter committee had the same idea! The best 60 seconds will now be judged every week by the 'winner' of the week before. For starters this week's judge was John Grantham (Grantham HR Consultancy) who recently dedicated the educational slot on how to make the best of your 60 seconds. I was curious if he and I would 'pick' the same winner of the week (crystal trophy as a 'reward', to hold on for just one week). Winner of this week (05/2007) was Steve Osborne of TMC (The Mortgage Company). During his 60 seconds Steve managed to explain very clearly why his company was different (independent), what extra services they provide (dealing for you with all parties concerned, including estate-agents, solicitors and surveyors) and what he wanted as referral today. And he made that very simple for everyone: if you would swap jobs with me for one day, who would be the first on your list you would call to become your mortgage customer? Side-note: best 'catch-phrase' of the day has to go to Alice Spink (of Windmill Communications), subbing for The Power Service (after explaining how important it is to have your electrical wires tested and in good order): "or it's not only your electricity bill that can give you a nasty shock". 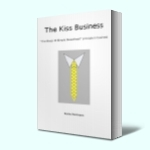 Normally Seth writes and blogs about marketing concepts (and is pretty good at it), in this book he goes one further by tackling business organisations (structures) and concepts in this fast changing world and fails miserably. Seth compares the needed changing process with evolution (memes versus genes), nothing wrong with that, but he spends (wastes) over half the book (chapters 1 through 6) going on and on and on about the fact that we’re all afraid of change, that for surviving in this fast changing world of ours we do need to change and evolve in adaptable – profitable - winning companies. His answer: learn how to zoom and the fear of change is gone (because you replace the word change with zoom and everything will be alright from that moment on) and we all live happily every after in profitable businesses while our non-zooming competitors are left behind, quivering with fear to change. Of course we need to change, embrace change in order to survive and evolve, and we need to face change head-on, scared or not. It doesn’t take till page 130 to make that clear. But changing the words doesn’t cut it for me. It takes guts to change, it takes guts to accept you’re afraid to go into unknown territory and it takes guts to evolve. Not the soft medicine Seth prescribes by softening, cushioning it in nice and not scary zooming steps. The other chapters are a bit more interesting, but nothing mind-boggling or ground-breaking (as the text on the back cover will have you believe). Best sentence in the whole book: Slack isn’t really slack; it’s an essential investment in tomorrow’s version of your company. Slack as in unallocated time in your working day, maximising efficiency when everyone is busy all the time. That’s the only idea from the book I’ll keep with me. If you want to read and learn how to ‘survive’ as business in this fast changing and competitive world you’re much better off with ‘Good to Great’ by Jim Collins and Co or even “Kick start your own Business’ by Robert Craven. Other books by Seth Godin were remarkable; with this he has deviated from his own ‘hedgehog-concept’ I’m afraid. Maybe it’s just me. Maybe I’ve always been a zoomer (still can’t get used to that word, keep thinking about cameras – zooming in or out): 'eternal student'; always brainstorming, experimenting with new ideas and learning from mistakes; thinking, talking, reading and writing about it. Maybe it’s just ‘obvious’ to me, who knows? That’s why I decided to include the link to Amazon.co.uk in this post, you can decide/find for yourself if zooming changes change. A cousin of mine runs a hair salon in our hometown: Camphens Coiffures. In fact he’s the third generation in this family run business. As children we used to have our hair cut by our uncle or aunt (or my cousin’s older brother or sisters). My cousin (we always called him Richardje, that’s little Richard in English) took over the reins of his father’s company 17 years ago and of what I hear he is doing very well. Wouldn’t you be happy to have your hair done by such enthusiastic team? And why are most business cards boring? Let them tell your successful message. Book review: Citizen Marketers - Ben McConnell & Jackie Huba. Finished reading Citizen Marketers yesterday evening. And as written in my pre-book review I stick to my first impression that it shows the other end of the spectrum of The Long Tail and Permission Marketing. Which of course does the title embed so I’m stating the obvious no doubt. The 1%-ers (yeah, I’m one ;-)) creating content on the new media (blogs, MySpace, YouTube and the likes) are an important and fast growing group of influential marketers (without being paid for it by the brands), most are advocates, fans or ambassadors of these brands or products who don’t like to be let down or ignored by their ‘heros’. And brands are advised to get used to it, to adept to it, even to embrace it or become loosing brands. Negative postings in the old media brands could always see as: “Today’s news is tomorrow’s fish & chips wrap-around”, people forget about it in no time. Not any longer with the new media: once logged, tagged, spidered it is there to stay, to be brought back at a click of a mouse on the search results, any time, any where. Brands, companies, even organisations better get their Citizens Marketing strategy together and ‘practice’ what Kent Blumberg wrote only a few days ago to handle negative criticism or feedback. Pondering over up coming posts on the subject Coach, Trainer, or Manager? with Liz on Liz Strauss [dot] com we stumbled on the word mentor. We both agree that mentors/mentoring can’t be placed in the same list. Why not? Personal experience with two mentors (I’ve been / am very fortunate) taught me that it is on a different level, even a different ball game, different setting. A mentor doesn’t stand on the side-line (coach), a mentor doesn’t teach you just a skill (trainer) nor does a mentor set your strategy (manager) – thanks for the perfect short and clear descriptions Liz – . Then what is a mentor? I won’t trouble you with history; just see wikipedia for that. To me a mentor is exactly what WordNet says: a trusted guide and advisor, mostly appearing then when the ‘student’ needs it. Giving/sharing freely his/her own knowledge, experiences, thoughts and insights as a guide to learn from, not a dictate. I don’t think both persons I consider my mentors (one past, one existing) even see themselves as mentors, I haven’t enlisted them specially to become my mentor, they just ‘turned-up’ on the right moment. In a supportive role, as bouncing boards for ideas (not to get their approval), sometimes even as a shoulder to cry on; but also challenging me to set higher goals, to become a better business manager, to create a better - profitable business. And never with penalties. Like I said: I’ve been and still am very fortunate to have found these two persons (and it’s the privilege of a writer – me - to combine them into one character in a novel ;-)). Can you hire a mentor, ask someone to become your mentor? Can someone appoint himself as your mentor? It is one of those special relationships, first build on trust, which almost unnoticed grows into mentorship. That’s why I don’t believe in mentoring programs or worse: mentor coaching! If any one has a different experience, please share that here, always willing to learn (of course). 37% of people running UK companies wouldn't start another business according to a survey by Sage. Government red tape and lack of innovation and passion were cited as the main reasons. However Britain is becoming more of an entrepreneurial nation, harnessing innovation and emerging business opportunities. One of the key objectives of the recently appointed UK Women's Enterprise Taskforce, chaired by Aurora's Glenda Stone and SEEDA's Pam Alexander, is to increase the quantity and quality of women starting and growing businesses in the UK, and Regional Development Agencies are providing excellent business growth support in 2007. Last week I asked the question, more for myself after a 'complaint' by my partner when enough is enough in regards to reading books, blogs etc on growing the business as well growing as an individual. "Remember, "Success is the journey", not the destination - you never stop. Like anything in life you move on just a little more each day. We all do - even I keep reading, attending seminars, talking, etc etc! I will never know everything - how boring is that?" Well for one thing, he's never boring. Last month I ordered another book: Citizen Marketers by Ben McConnell and Jackie Huba. It was more pre-ordering, the book was just launched and it can take a while before it crosses the ocean. "Thanks for being part of our Citizens Marketers book launch! In return for purchasing a copy of the book during its launch, we are sending you this 1% patch. Why a 1% patch? The people who write blogs, record podcasts or otherwise create content as a hobby are the early adopters -- the outlaws of culture. Their numbers are small, yet their influence is growing. We found during our research for Citizens marketers that about 1 percent of a democratized community will create content for that community. That led us to create the 1% rule, which we cover in the book. We hope you enjoy the book"
but who are also able to create one-hit blockbusters. Think I'm going to really like the rest of the book also. In the business world (and other worlds too, I suppose), it occasionally pays to be brief (thank goodness blogging doesn’t!) Not everyone has the gift, I know, but perhaps practice is all you really need. I’m guessing lawyers would be good at it (because they’re always writing in their briefs) but I know one of the hardest things I’ve ever had to do was write an abstract for the first proposal I ever did. Have you ever tried to condense and summarize 96 pages into two paragraphs? (Well, I couldn’t do it either – mine was almost two pages. Umm, I’m almost sure that’s why we didn’t get the work.)" "Have you ever tried writing within extremely severe constraints (time, space, words, content)? Sure you have! Not so easy, is it? What if you were given an assignment where you had to write a complete story, but were limited to, let’s see… we’ll make this a hard one: six – yep, you read it right – only six words?" Read more on the gauntlet, the contest ends on Sunday 21 January. "The catchphrase, it tells the story"
"Wood You Like, Natural Wooden Flooring"
BNI stands for Business Network International, a business breakfast network organisation which meets on a weekly bases in aim to refer more business among its members by its members. As so many other business clubs (try) to do. IMHO and although I don’t always agree with BNI head-office, BNI chapters are more successful in doing so than other business referral clubs/organisations for the simple reason that BNI is based on ‘Givers Gain’. And not just in: I give you business, you give me business; it goes much deeper than that. We had been members for 4 years when we didn’t renew our membership 1.5 years ago, due to circumstances (lack of transport being one of them, opening a showroom and working flat out another). Now we’re thinking of rejoining again. When we became a BNI-Ashford member all those years ago we managed and worked for another company (which went bust, but that’s a very different story). At first I saw the weekly meetings just as an opportunity for ‘branding’: making more people (commercial or domestic) aware of our product and services. This soon changed. And those who do only see it as a branding opportunity miss out on a lot of network benefits (and most don’t stay member long, disappointed as they become when their expectations – growing their business without giving others their due – aren’t met). What I experienced week after week was contacts, contacts and contacts; given freely without a second thought. Business contacts of course, but also social contacts, personal contacts. And when you’re a stranger in a strange country that is even more important (for who didn’t know: we’re Dutch people living and working in the UK for almost 7 years now). Especially during the period when the company we worked for went under and we had to make a very hard decision: going back ‘home’ or ‘going-it-alone’ our membership of BNI-Ashford came up trumps. I’m still convinced that without certain chapter members we wouldn’t be where we are today. I won’t mention names, but they know who they are and anyway, most are ‘hidden’ in my novel. They ‘pulled’ us through and pulled us forward, all based on that one principle: givers gain. Giving advice, giving help, giving confidence-believe in us, even a shoulder to cry on; gaining a new company not loosing one, gaining the pleasure (pride even) in the fact that we are growing and becoming successful. I owe them a lot. But besides that, BNI-Ashford membership also taught me speaking in public (still with an accent), learn how to ask for business and become better in the so-called ‘elevator-pitch’ i.e 60 seconds presentation. for every 60 seconds presentation in the (near) future. Tips given freely; gaining recognition, gaining pride in seeing others using it?